Meet St. Nicholas the Wonder-Worker. A friend was struggling. You could see it in his eyes and in his growing estrangement from his family and from church. I prayed for him, sensing he was headed for deep trouble. And since the need was so great and the crisis so near, I entrusted my friend to the care of St. Nicholas of Myra. This bishop of the early churchthe real person behind the figure of Jolly Old Saint Nickmight not strike you as an obvious choice when it comes to interceding for a desperate case. But Nicholas has long been the most beloved of the wonderworker saints honored by Eastern Christians. Pretty much everything about Nicholas is a wonder. His legendary generosity and compassion for the poor. The miracles of healing and protection that he worked, sometimes from a distance. Even his bones are wondrous. Ever since his death in the fourth century, they have secreted a liquid that has been associated with many physical and spiritual healings. Generous Giver. A certain mystery surrounds the life of Nicholas. This is because early biographers, wanting to emphasize his holiness, tended to embellish the facts and the stories people were telling about him. 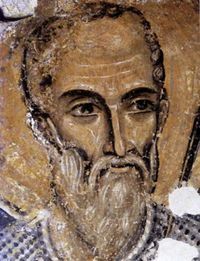 Historians agree, however, that Nicholas was born in the second half of the third century and that sometime in the next century, he became bishop of Myra, in Asia Minor (modern Demre, Turkey). Myra and nearby Patara, which is considered Nicholas birthplace, were travel hubs in the Roman province of Lysia. Since St. Paul stopped at both (Acts 21:1-2; 27:5), I like to think that Nicholas might have been a descendant of his converts from two hundred years before. Tradition has it that Nicholas was the only child of devout and wealthy parents, both of whom died when he was young. But unlike the rich young man of the gospels, it seems that his wealth didnt keep him from following Jesus. From very early on, he was known as a generous giver, especially to those in need. The biographies tell how Nicholas became a monk, visited the Holy Land, and was chosen bishop by divine intervention. Highlighting his devotion to Jesus, they recount his imprisonment and torture during Emperor Diocletians persecution of Christians. Some sources mention a stormy encounter at the Council of Nicea (325), where Nicholas is said to have struck Arius for denying the divinity of Christ. Ready and Able. The tone and quantity of the writings about Nicholas indicate that something about him touched people deeply. What was it? Though he had not wanted to be a bishop, Nicholas accepted it as Gods call. He knew, too, that it required him to live no longer for himself but for the people entrusted to his care. As he worked at living out this ideal, Nicholas became a faithful friend and protector, making himself available to anyone who called on him. Not only that: For most of his life, Nicholas exercised two very dramatic spiritual gifts: healing and mighty deeds (1 Corinthians 12:9-10). As God worked through Nicholas to save people in desperate straits, stories of miracles began to circulate. Some grew fanciful in the telling, but others preserve the memory of genuine incidents. They reveal why Nicholas became the much-loved protector of so many different groupsamong them children, sailors, prisoners, travelers, and the poor. Miracles of Mercy. One story tells how Nicholas, while sailing to the Holy Land, instantly calmed a violent storm that rose up around Cyprus. Through his prayers, God saved the crew and passengers from shipwreck and healed a sailor who had fallen from the mast. Another story describes Bishop Nicholas hurrying to the scene of an execution and intervening to save three innocent people just as the sword was about to fall. It goes on to tell of three Roman officers who witnessed the event: When they, in turn, were falsely accused, they prayed to Nicholas, and he appeared in a dream to warn Emperor Constantine of the miscarriage of justice. Nicholas was also known as a defender of children. There are many variations of an incident in which he solved a murder and brought the three young victims back to life. On another occasion, he rescued a peasant boy who had been kidnapped and taken to Crete. The best-known incident concerns three young women whose fathertoo poor to support them or to supply the dowry they needed to marryresolved to sell them into slavery, one by one. Alerted by God, Nicholas met the familys need by tossing a bag of his own gold through their open window on three successive nights. Everyone Knows Nicholas. The wonders didnt cease after Nicholas died on December 6, around a.d. 345. Recognizing his holiness, people thronged to Myra to pray at his tomb. The sick were anointed with the liquid secreted by his bones (called manna), and many healings were reported. The wonders continued even after 1087, when sailors spirited away his relics to Bari, on the southeastern coast of Italy. That city, too, became a major pilgrimage destination. Devotion to St. Nicholas spread like wildfire, reaching even to Russia. The Eastern Roman Emperor Justinian built a great church in his honor in Constantinople; many other churches followed. By the fifteenth century, Nicholas was the most popular non-biblical saint in the Christian world. Throughout Europe, people remembered him on December 5, the eve of his feast, by making anonymous gifts of treats to needy childrena custom that recalled his generous heart. Enter Santa. In the early nineteenth century, a quite different kind of wonder began to unfold in the city of New York. In a development that our ancestors in the faith would have found astonishing, holy Bishop Nicholas was repackaged as a fat, bearded elf in a red suit. It began in 1809, when the New York Historical Society decided to promote St. Nicholas and to recapture the Christmas traditions of the citys early Dutch settlers. Those settlers had not, in fact, continued their St. Nicholas traditions in the New World, but this lack was quickly met. That same year, writer Washington Irving published a satirical account of New Yorks Dutch history. The spoof included descriptions of a jolly, pipe-smoking St. Nicholas who flew over treetops and slid down chimneys to deliver gifts. The fiction quickly became an urban legend. In 1822 came the hugely popular poem by Clement Clarke Moore, A Visit from St. Nicholas. This gave the bishop his furs, sleigh, and reindeer, along with a date change: the night before Christmas. Illustrators and commercial artists did the rest. By 1931, a hefty Santa Claus (from Sinterklaas, the Dutch name for St. Nicholas) was advertising Coca-Cola. Today, the whole world recognizes Santa. By comparison, not many would recognize the face of St. Nicholas. Wonders in Bari. 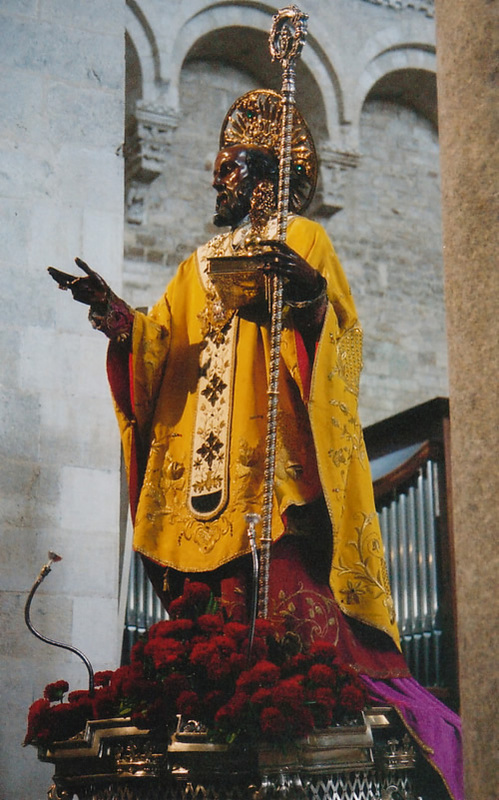 But scientists have been working to discover the real face of Santa. The process began in the 1950s, when the Basilica of St. Nicholas, in Bari, was renovated. The saints bones were exhumed, and a Vatican commission was established to study them. Anatomy professor Luigi Martino meticulously examined, measured, and X-rayed the bones in the casket. He determined that they all belonged to an older man who stood about five foot six, ate a mainly vegetarian diet, and had a broad forehead, rather large eyes, and somewhat prominent cheekbones. The condition of certain bones suggested that he had done time in some damp jail, wrote Dr. Martino. He concluded that his findings were consistent with the life of St. Nicholas. More recently, Francesco Introna, a professor of forensic pathology, used the latest techniques to analyze the data on the skull. His findings revealed a Nicholas with a broken noseperhaps another souvenir of imprisonment. Facial anthropologist Dr. Caroline Wilkinson then created a computerized, three-dimensional reconstruction of this head. Both this model and Dr. Martinos sketches show similarities to traditional images of Nicholas handed down by iconographers. The 1950s studies also included an examination of the manna. Scientists said the liquid was not easily explainable and determined that it did indeed come from the bones, not from an outside source. Recognized as an authentic relic, the manna is collected every May 9, which marks the translation of the bones from Myra to Bari. Orthodox and Catholic join together to celebrate the feast, making it an ecumenical event. The Dominican friars who serve the Bari basilica also see St. Nicholas as an ecumenical networker. With so many Eastern Christians coming to the shrine, they pray and work especially for the restoration of full communion between the Catholic and the Orthodox Churches. To that end, they maintain an Orthodox chapel in the basilica, near Nicholas tomb. They also oversee an ecumenical institute that brings Orthodox and Catholics together in many ways. God willing, I will visit Bari someday, and I will pray there for Christian unity. I will rub shoulders with its Orthodox and Eastern Catholic pilgrims, who turn to St. Nicholas the Wonder-Worker daily, for needs great and small. And I will join them as they thank God for wonders worked through his intercession. I will thank him especially for the way he saved my friendthe struggling one who had lost sight of the truth and was making a mess of his life. Exactly how God did it, Ill never understand. All I know is that every Sunday, I stood before the icon of St. Nicholas, locking eyes with him as I prayed for Gods mercy. During those months, my friend began responding to grace. Gradually but unmistakably, he came alive in the Lord. Today, several years later, hes a different personjoyful, full of faith, living for Jesus, and raising his children to do the same. Sundays still find me at that icon of St. Nicholas, but now Im praying for another needy situation. So many people could use a miracle! I expect that when I get to Bari, Ill be thanking Godand his servant Nicholasfor a happy ending to many more stories. Louise Perrotta is an editor for The Word Among Us. Reconstructions of St. Nicholas face can be seen at www.enec.it/Cripte/reliquie.htm and www.stnicholascenter.org, a Web site that offers a wealth of information on St. Nicholas, including many ideas for celebrating his feast. Some of these stories are lost in the modernism of today's time. The Real St. Nicholas  How Did a Cantankerous but Holy Bishop Become Jolly Ole St. Nick? Saint Nicholas and the other saints of Advent surround the Eucharistic Advent of the Lord just as they will surround Him with the angels in the glory of His Advent at the end of time. How important it is to acknowledge the saints of Advent, to seek their intercession, to rejoice in their lives. Those who would banish the saints from the celebration of the Advent liturgy are misled and mistaken. The mission of the saints of Advent is to prepare us for the coming of Christ: for His final advent as King and Judge, yes, but also for His humble daily advent hidden under the species of bread and wine. In no way do the saints detract from the intensity of the Advent season. Each of them is given us as a companion and intercessor, charged with making ready our hearts for the advent of the Bridegroom-King. Saint Nicholas arrived in America with the Protestant Dutch settlers in 1624 in what was then called New Amsterdam. As much as the gloomy Protestant Reformation in Holland tried to suppress the cult of the Saints, the Dutch would not give up their beloved Saint Nicholas. Dutch customs, expressions, and even language persisted in New York right into the opening years of the last century, but by that time others had come through Ellis Island, New Yorks port of entry -- Italians, Russians, Ukrainians, Poles, and Greeks. They came bringing icons of Saint Nicholas lovingly wrapped in the trunks that contained all their worldly possessions. They came bringing prayers to Saint Nicholas learned as little children, and armed with a confidence in the intercession of Saint Nicholas that withstood poverty, prejudice, hunger, sickness, and all the vicissitudes of a new life in a strange land. Saint Nicholas has always had enormous appeal. He is recognized as the patron saint of more causes than of any other saint, of classes of people, cities, churches, and whole nations. He is the patron saint of thieves -- not because he helps them to steal -- but because he helps them to repent and change; of pawnbrokers and bankers because he knew how to use gold in the service of compassion and charity; of pharmacists, fisherman, lawsuits lost unjustly and the lawyers who lost them, prisoners, orphans, prostitutes, unmarried men, scholars, haberdashers, and bishops. He is best known as the patron saint of children, especially children who are threatened by the circumstances of a troubled family life, or by abuse. I like to think of Saint Nicholas also as a patron and friend of priests. More than ever before it is crucial that priests place themselves under the protection of the saints and live in their friendship. Saint Nicholas has much to teach priests: passionate devotion to Christ true God and true Man; compassion for the poor; and the courage to defend children from all dangers of body and soul. Pray to Saint Nicholas today for all priests, but especially for those who have grown fainthearted and weary, and for those attacked by the noonday devil. Saint Nicholas is present to us today. He will accompany me to the altar, taking his place there among the other saints and angels invisibly present in every Holy Mass. 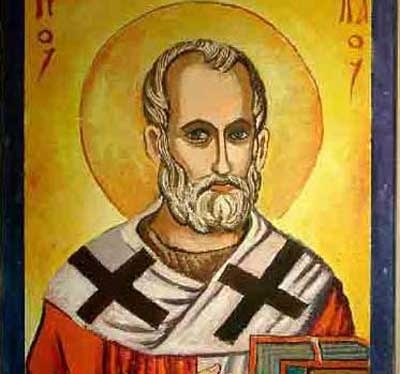 More than anything else, I would ask Saint Nicholas to open the eyes of our souls to the Eucharistic advent of Christ. If we are prepared for Christs coming in the Holy Mysteries, we will be prepared for His final coming in glory. One who lives from one Holy Mass to the next need not fear the Day of the Lord. Glorious Saint Nicholas the Wonderworker, pray for us that we may be made worthy of the advent of Christ. "Orthodox Christians, however, were sensitive and attentive to the presence of the Pope in a city that John Paul II had called a bridge to the East."
It's nice to think of +Nicholas being in such a procession and hearing this hymn, but the Cherubikon wasn't put into the Divine Liturgy until the early 6th century, centuries after he had died. Note: this topic is from 12/06/2010. Thanks Salvation. 6) St. Nicholas -- one of the inspirations for Santa Claus (270  343 AD) -- Aided by software simulation and 3D interactive technology by Liverpool John Moores University's Face Lab, the above-pictured 3D model reconstructed in 2016, was the result of her detailed analysis  though it is still subject to various interpretations. According to renowned facial anthropologist, Caroline Wilkinson, the project was based on "all the skeletal and historical material".